Expect a flying robot Dragonfly next year from Robosapien creators WowWee. The flying robot is powered completely by flapping wings - no propellers. According to T3, it can fly for 15 minutes within 150 feet of the remote control. Don't forget to check out the WowWee page at ROBOTERIA. The design of the robot fly is based on the ornithopters of Sean Frawley who is currently a student at Embry-Riddle Aeronautical University and consultant to toymaker WowWee. The design is based on the rubber-band powered ornithopter plans that Frawley designed while in high school. With a friend he started a online business, Ornithopter Technologies, selling the flyers. 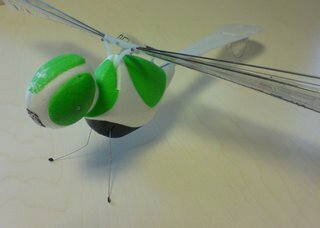 WowWee expects to have the Dragonfly robots available for sale by next Christmas. They have a debut planned for the Consumer Electronics Show next month. UPDATE2: Radio Shack shows these available now for $50 with a 1-2 day delivery. I have not ordered one myself so I don't promise anything. If someone else gets one that quick please post a comment here. It even *sounds* like something out of a cheap horror movie! Thanks for the update, Doug! I just got one of these today! Flies fairly well, although it takes a while to get the hang of it. My particular model seems to want to bank left if it gets unstable, but with careful attention to the throttle, it flies pretty straight. I've taken a few jaunts outside so far and have dabbled with a few indoor flights.